I’ve had a few people ask me recently about how we do chores at our house. A year or so ago, I shared this post about the chore system I was rolling out then. 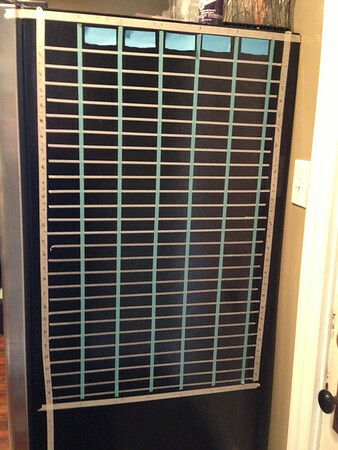 It seemed to work really well for about a year and then fizzled, as many of our chore systems are wont to do. 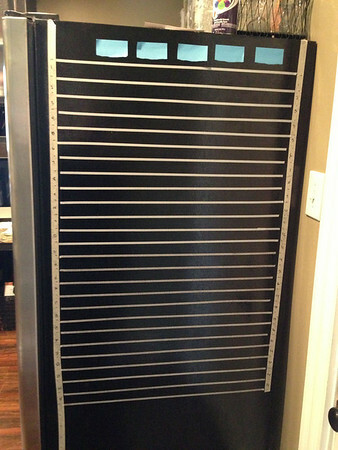 So I thought through and prayed and planned and designed a new chore system utilizing washi tape, scrabble tiles, RIT dye, glue on magnets, and the side of the refrigerator. It was pretty, it was elaborate, it was detailed. And it was a complete and total flop. Given, we were at the end of the school year (when everyone is just done) and then we decided to move, so who knows if they would have taken to it. But, we are starting a new new system now (which I will share about later in this post), but first, the flop system, because it really may work for someone else. I purchased generic scrabble tiles from Michael’s and dyed them one of three different colors. The colors corresponded to the value or pay of the job. Purple = no pay, you do it because you live here; Red = small pay, daily job; Green = more pay, weekly or rarer job. 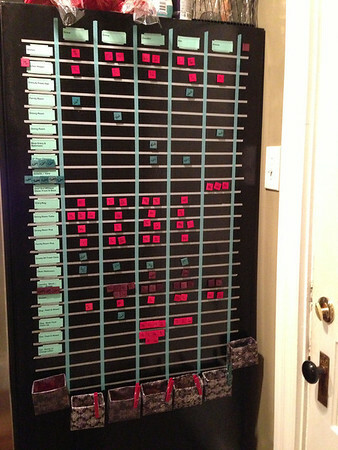 The tiles were then placed under a name and next to a job at the beginning of each week and the girls were supposed to be responsible to check the chart and do their work. More tiles were dyed the same colors. When a job was completed, they were to drop a corresponding color tile in the box below their name. Tiles were counted at the end of the week to determine payment. Learning from that experience and now that we’ve moved, we are taking a different approach to chores, one I’m pretty excited about and that seems to work in our “wired” and list-oriented family. It started when we were in the process of moving. Matt would email out a schedule for the week to me and a job list to the older girls each day, copying me on the email. I noticed quickly that the girls did really well with this, so I started trying it too. 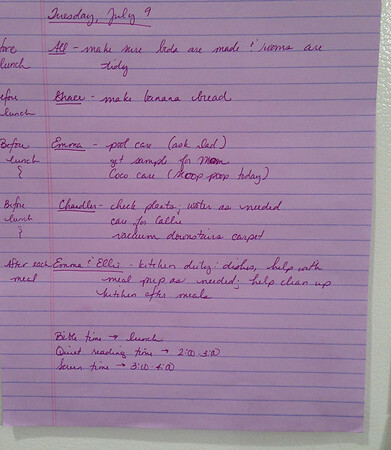 I’m still a pen-and-paper person when it comes to to do lists, so sometimes they get emailed and printed, sometimes they are handwritten, but they always get posted on the fridge for everyone to see. The daily note includes jobs for the day, as well as a loose schedule. As for the indoor work (helping around the house, making beds, doing laundry, keeping things generally picked up so I don’t go insane, etc. ), our kids need incentives. I wish they didn’t, but they do. For a long time it was the small pay for small jobs. But the older girls are earning more money now and a quarter really just doesn’t motivate them much and I can’t afford a dollar a day x five just to get beds made. So, taking a cue from Cleaning House (please read this book if you have kids of any age still at home – so good! ), we are starting each month with a jar full of ones. The author of the book did a jar for each child but that’s just not in the budget, so we’re doing one jar for the whole family, but with a little more money in it. If jobs that can (and should) be completed before lunch are, the money stays for the day. If they are not, I pull out a dollar. So, yes, one child can ruin it for everyone, but that’s the way it tends to go in large families. Money that is left at the end of the month will be used to plan a family night since frequent eating out was one thing that got nixed when we decided to move. The main indoor job right now is helping in the kitchen. This used to be a me plus one person job and I realized that it really needs to be me plus two kids, so I made a rotation pairing the girls up (an older with a younger every day) and those two are responsible for dishes, cleaning up the kitchen after meals, and helping with meal prep each day. The other big job is taking care of the dog which has been moved to a weekly rotation and that child has to feed and water her, clean up after her (outside messes, as well as vacuuming the carpet where she tracks in dirt), and make sure she’s kenneled when we leave and her door is locked at night for the entire week. Things like cleaning and other jobs are just “as needed” right now and aren’t really on a rotation yet. I’m sure one will come into being as we get more settled in the coming weeks and months. This turned into a rather long and winding post. I guess that happens on one cup of coffee and not a lot of sleep. This is what’s working for us right now. What chore systems work for your family?